Drive past Inverurie and under that old bridge where you have to wait for the traffic lights to change. A couple of miles farther, on the left hand side of the road, you will see a signpost directing you up a narrow winding road which takes you to the Maiden Stone. This is a pink granite monument dating back to Pictish times bearing some fascinating carvings. The exact dates and original significance of the stone are largely a mystery but one suggestion is that the name may possibly be derived from an early Scottish Saint called Medan. The stone does bear both Christian and pagan images. A much later local legend relates a story about a young girl, the daughter of the Laird of Balquhain who made a bet with a young stranger that she could cook bannocks faster than he could build a road to the top of Bennachie – the prize being the girl's hand in marriage. Unfortunately for the girl, the young man was actually the Devil so he succeeded in finishing the road before the bannocks were ready. Realising who the young man was, the girl fled and prayed for salvation. She was turned into the Maiden Stone and the triangular notch near the top of the monument was supposed to be where the Devil had tried to grab the girl's shoulder. The stone and its legend have inspired a talented young local composer Joe Stollery to craft a new opera based on the legend. He was helped in this enterprise by Catriona Yule, a young Scottish writer who provided the libretto for the opera. 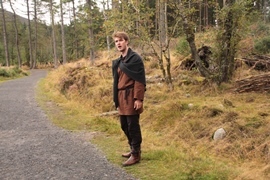 The first performance took place in the grounds of the Bennachie Centre on Friday 5 September at 1pm. It was a unique all-encompassing artistic experience that I thought was utterly brilliant. Catriona has made changes to the original story in her libretto. The young man Dirk played by Colin Brockie is not exactly the Devil himself but rather someone who has sold his soul to the Devil. The Devil's emissary Loki was sung by a young boy treble Stuart Jack. Jillian Bain Christie was the girl Marn, while young local primary school pupils trained in dance and movement by Margaret Hearne played the bannocks and boulders that in this version of the story spring to life. In this version of the story they help free Dirk from his contract with the Devil. The Devil is purged from the young man's soul and this time it is Satan who is turned into stone while Dirk and Marn go off hand in hand – presumably to live happily ever after. Loki, the Devil's emissary blends into the audience, which is a fascinating idea. I know him only too well! Joe has scored his opera for string quartet, flute and percussion. The fantastic success of this enterprise was due in large part to the fine quality of all the young and talented musicians taking part. Kay Ritchie was the flautist while the string quartet featured Aden Mazur and Ruth Earnshaw as first and second violins, Mark McNamee on viola and Peter Davis on cello while Jeffrey Wang was the percussionist. Pete Stollery was the conductor who wove all the strands of the performance seamlessly together. What raised this performance to a heroic level was the fact that it took place outside in pouring rain. Many audience members including myself had umbrellas but not everybody. Pete Stollery, the singers and the primary pupils had to face the elements unprotected and like the fantastic troupers they were it seemed to bother them not one bit. Actually, the rain seemed to add to the overall atmosphere of the event. Kay Ritchie led us off into the woods as we were told to follow the sounds of her flute. This in itself seemed to weave a special kind of magic. The performance was a series of tableaux taking place at various stations along the track reminding me of some of the medieval miracle plays where the audience follows the action on foot. No other opera has had such extravagantly amazing scenery – we could even smell the smoke coming from the fire on which Marn was cooking her bannocks. I felt that we were really drawn into the action as if we ourselves were taking part in it. The three singers delivered their parts with stunning clarity and fantastic characterisation – just what an opera demands. I thought Joe Stollery's writing for flute, strings and percussion was dazzlingly pictorial. There were hints of Scottish dance music at perfectly apposite points in the story while he was able to create a thrilling sense of atmosphere and to underline the feelings of his characters suggesting menace too where that was required. Above all, this was a performance which appealed to every one of our senses; visual, aural even the smell which emanated from the fire. There was also the enjoyment of taking our own part in the action as we walked up the hill to each one of the staged scenes. My memories of the Maiden Stone will always be coloured by this fabulous event.